Have you or your little ones ever dreamed of escaping to a place where you can hop, skip, and jump your stress away? That place exists, and it’s right here in Fort Lauderdale! If you’re looking for your next best family vacation spot, we recommend Rockin’ Jump Trampoline Park in Fort Lauderdale! It’s one of many kid-approved attractions and activities available here in “The Venice of America.” We’ve compiled everything you need to know about it! If you’d like even more insight into the best family-friendly restaurants, excursions, and more, be sure to claim your complimentary Fort Lauderdale Vacation Guide! If you’ve never been to a trampoline park, you’re missing out on a physical experience like no other! Rockin’ Jump is one of the absolute best things to do in Fort Lauderdale with kids. Instead of a typical gym experience, Rockin’ Jump offers guests fun, physically engaging features like pools of soft foam cubes, wall-to-wall trampoline arenas, rock-climbing walls, bouncy basketball courts, and so much more. In short, this zany place is every high-energy kid’s dream come true! A full day of jump time (Monday through Friday only): $30. The park has a special allocation of hours each day for general admission, birthday party, and smaller (toddler) guests. Be sure to check the Rockin’ Jump hours for your chosen day before booking your session! The Museum of Discovery and Science in Fort Lauderdale. Stay Near Rockin’ Jump Trampoline Park in Fort Lauderdale! There are so many family-oriented activities and attractions available in Fort Lauderdale, but what about lodging? 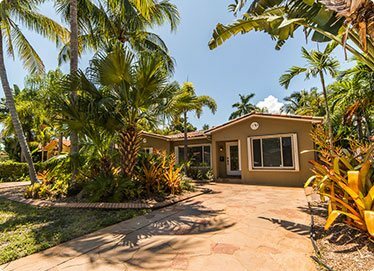 If you ask us, a private vacation rental on the beach, in a safe and beautiful neighborhood, or along one of Fort Lauderdale’s gorgeous canals is the best place to stay! At Fort Lauderdale Stays, our top priority is making sure you and your crew have an amazing time during your South Florida vacation. Each of our homes features premium amenities like pools heated to 88 degrees, fully stocked kitchens, outdoor patio areas, and complimentary beach equipment. Our guests also have the option to use our convenient concierge service, which can provide family photography, private chefs, and more! Ready for the ultimate family getaway in Fort Lauderdale? Check our availability and book a stay with us now! We can’t wait to host you and yours. You Need to Dive Into the International Swimming Hall of Fame! — What Are the Best Rooftop Bars in Fort Lauderdale?